Corner exhibition quad gantry stand 5M x 3M x 3M high. Very impressive Brightly Back lit fabric banners, with nylon bar ribbed and pocketed hemmed sides give tension to the fabric so no creases! The fabric banners are powered by the brightest 50W LED back lighting which certainly ensures this stand will be noticed! S35 Quad gantry stand is easy to build and the 220mm square lighting truss structure provides all that is required for single or double sided fabric rear illuminated fabric graphics. Options below for the stand on its own, add the lights and the banners as required. 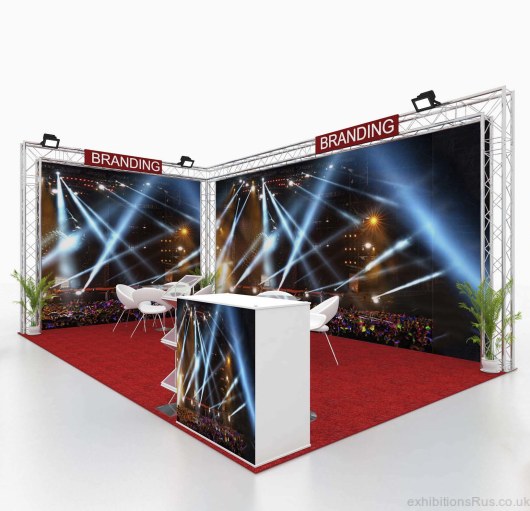 We can make this stand any size to suit your shop window show or exhibition. The stands can be permanent or temporary.